Students in John Jay’s International Criminal Justice (ICJ) BA major participated in the European Society of Criminology conference held in Sarajevo, Bosnia and Herzegovina, at the beginning of this fall semester. The theme of the conference was Crimes Against Humanity, which is also a key focus area for the ICJ program. Students Raymond Hilker, Amina Majeed, Cynthia Moreno and Aline Shaban had the opportunity to submit research papers on this theme and make presentations at the conference – with faculty support and guidance, particularly Professor Mangai Natarajan, who participated in the conference as well. This was the first exposure to an international conference for the undergraduate students, especially in a country that is still rebuilding after the genocide. One of the most horrific international crimes, the Bosnian genocide resulted in the death of more than 100,000 people (80 percent of them Bosniaks). The International Criminal Tribunal for the former Yugoslavia (ICTY), created by the U.N. Security Council in 1993, was the first international body to prosecute the genocide, among other war crimes. The ICJ students also visited Srebrenica, “a city of refuge” created by the United Nations, where more than 40,000 people sought shelter from war when the Serbian army began their assault. They visited the memorial honoring the 8,000 people who died in the first wave of killings. 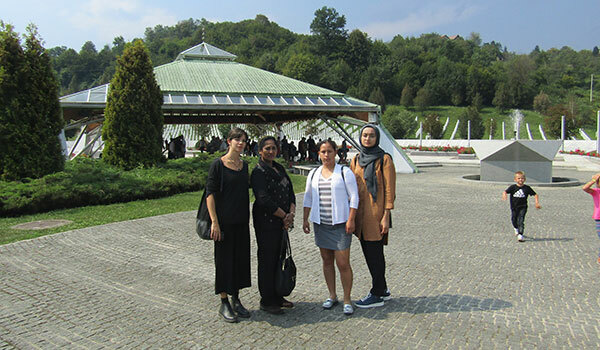 As Professor Natarajan noted, “you become numb with sadness when you see the scale of the crimes.” The students rounded out their unique experiential learning opportunity with a visit to the Genocide Museum in Sarajevo. It was a moving experience for the participating students, and it all started with the conference, where they networked with international scholars, received feedback on their research presentations, and identified opportunities to publish their papers in journals and speak at international universities.